Creating Thiessen (Voronoi) polygons using lines (rather than points) as the input features? 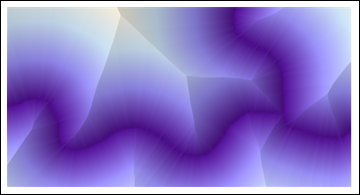 I have a set of line features inside a particular polygonal boundary. For each line, I'd like to generate a polygon inside which every possible point is closer to the given line than to any other line in the layer. I've done this in the past for point input features using Delaunay triangulation, but if there's a similar process for doing it with line features I haven't been able to find it. ETA: Geogeek's solution had occurred to me, but in straighter sections where the input lines have fewer vertices, the resulting polygons get way too close (even overlapping) a line that they shouldn't. Here, the red lines are my inputs, you can see the vertices and the Thiessen polygons generated from them. Perhaps a quick and (very) dirty solution might be to convert each line to a plentiful set of evenly-spaced points (rather than the line's vertices only), generate Thiessen polygons from those, then dissolve them based on the originating line ID. To illustrate a raster/image processing solution, I began with the posted image. It is of much lower quality than the original data, due to the superposition of blue dots, gray lines, colored regions, and text; and the thickening of the original red lines. As such it presents a challenge: nevertheless, we can still obtain Voronoi cells with high accuracy. What this has accomplished, in effect, is to identify five oriented linear features. We can see three separate linear features emanating from a point of confluence. Each has two sides. I have considered the right side of the two rightmost features as being the same, but have otherwise distinguished everything else, giving the five features. The colored areas show the Voronoi diagram from these five features. 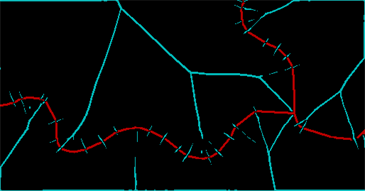 A Euclidean Allocation command based on a layer that distinguishes the three linear features (which I did not have available for this illustration) would not distinguish the different sides of each linear feature, and so it would combine the green and orange regions flanking the leftmost line; it would split the rightmost teal feature into two; and it would combine those split pieces with the corresponding beige and magenta features on their other sides. Evidently, this raster approach has the power to construct Voronoi tessellations of arbitrary features--points, linear pieces, and even polygons, regardless of their shapes--and it can distinguish sides of linear features. Convert line vertices to points(line_points). make voronoi polygons using the points(line_points). dissolve the resulted polygons using either an id attribute which has been saved from line layer , or by a spatial join with line layer. i wish i have really understood your question , if not you can you provide a drawing, to explain more your needs. Not the answer you're looking for? Browse other questions tagged qgis arcgis-desktop arcgis-10.1 polygon proximity or ask your own question. Buffering polygon until it hits neighbor using PyQGIS? How to automatically convert line features into polygons using QGIS/PostGIS? Polygon vertices disappearing/merging when less than 5 ft apart in ArcGIS Desktop? Calculating delaunay triangulation with two diagonal lines using ArcGIS Desktop?